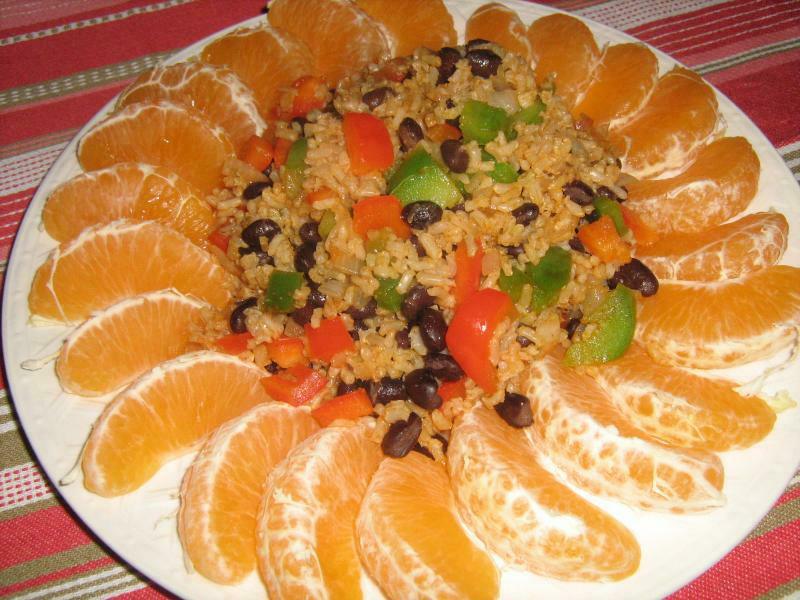 Here is our (vegan) adaptation of a classic Spanish rice and beans dish. Spanish Style Rice and Beans - This adaptation of traditional Spanish Rice and Beans leaves out one ingredient that the Spanish would "typically" use...hard boiled eggs. If you're an LOV vegetarian or any other non-vegan, then add two hard boiled eggs as a topping to the dish and you have the classic Spanish Rice and Beans dish. We think our vegan version is perfect! And with 20 grams of protein per serving you can't go wrong! Plate the finished dish with a ring of orange slices or the fruit of your choice, to add a little more color and flavor. Yum! In a large skillet, heat the olive oil over a medium-high heat. Add in the sea salt, peppers and onion and sauté for about 3 minutes. Add the pre-cooked brown rice and the cumin and paprika. Cook for 3 minutes then stir in the black beans. Allow to cook until heated through; about 5 minutes. Plate to a serving dish ringed with orange slices or the fruit of your choice.